Advanced Segmentation enables you to isolate and analyze subsets of your traffic. 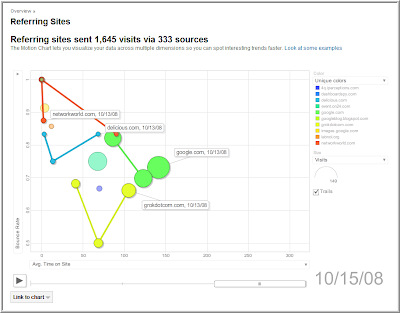 It is true on-the-fly segmentation of visits so that you can create powerful filters with a few mouse-clicks. Select from predefined custom segments such as "Paid Traffic" and "Visits with Conversions" or create new custom segments with a flexible, easy-to-use segment builder. Then, you can apply one or more of these segments to current or historical data, and even compare segment performance side by side in reports. 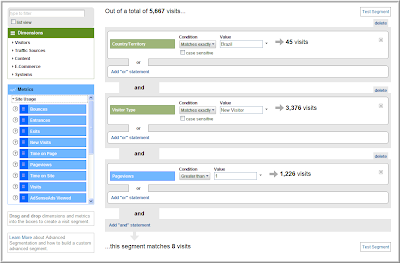 *Also, Avinash has just posted a blog on how to use Advanced Segmentation which is a must-read to quickly learn how to take advantage of this powerful feature. Custom Reports are reports you create, save, and edit to give you a specific view of your data. You can choose the information and metrics you want to see, organized in the way you want to see it, by using a drag and drop interface to populate an Analytics report. You can also create tabs if you want to see related data - similar to a "Goal Conversions" tab - in effect creating multiple levels of sub-reports. Motion Charts add sophisticated multi-dimensional analysis to most Analytics reports. Select metrics for the x-axis, y-axis, bubble size, and bubble color and view how they interact over time. By comparing metrics visually over time you can expose data relationships that would be difficult to see in traditional reports. Motion Charts will be available through a new "Visualize" button at the top of reports. The New Account Management Dashboard makes it easier for you to manage and monitor your account by providing simpler navigation between accounts and profiles and displaying a dashboard of key performance metrics upfront upon login. Meaningful data and clear visual cues (green is good, red is bad) help alert you to areas requiring more attention. We hope the new navigation, administrators' ability to rename accounts and profiles, and account/profile locator functionality will boost your efficiency and ease of account management. Learn more in this help center article. The Data Export API enables you to create software programs and applications using all read-only report level data from Analytics. The data exported can be used in any number of ways, such as building custom dashboards, creating data visualizations or interfaces, performing offline analysis, and combining/mashing Analytics data with other data sources. The API will be a platform for developers to extend Analytics data in new and practical ways, as far as can be imagined and implemented. Integrated Reporting with AdSense lets AdSense publishers see their revenue and impression data alongside their site traffic data in Analytics. Take a look at the AdSense blog for more details. This integration will give publishers even more metrics to help them measure visitor activity and the performance of ad units, as well as discover areas of revenue potential on their websites. If you don't already, you'll soon have access to these new features. Once you get a chance to use them, we invite you to discuss them and give us feedback in our user forum. We hope you'll find them useful and intuitive. Over the past year, our team has been gathering a feature wish list from you, our customers. We also asked experts in the web analytics industry and listened to customers of other analytics tools to find out what additional functionality they would like to see added to Google Analytics to make it as powerful, flexible, and useful as a web analytics tool can be. Today at the eMetrics Summit in Washington, D.C., after months of development and testing, Avinash Kaushik, our Analytics Evangelist, unveiled the new functionalities that represent a major upgrade to Google Analytics. With these features, gradually being released in beta in all accounts, you'll gain much richer insights into your website traffic, and it'll be even easier to discover, create, and access the metrics important to you. They are (with more details below): Advanced Segmentation, Custom Reports, a data export API (private beta), integrated reporting for AdSense publishers (private beta), multi-dimensional data visualizations called "Motion Charts," and an updated user and administrative interface. These are features that experts and enterprise-level customers demand, and they will be available and easy to use in your Google Analytics reports. Please see below for details on each new feature and the release schedule letting you know when you can expect to have access to them. Here is a screenshot showing you where in your reports you can find a few of the new features, with more screenshots, help center links, and video demos (also at this YouTube playlist) below. Today, you may have noticed a little polish in your Google Analytics report interface . The layout is a little cleaner because we added some color consistency and contrast between sections in the interface so that it's easier to distinguish between the navigation on the upper left, the help areas below that, and the report itself. We also made the controls at the top of the report (email, export, etc.) a little easier to see and identify. Overall, the appearance is a little less busy, the lines are a little cleaner, and the important areas hopefully stick out a little more, making Google Analytics even more appealing to use. he fourth quarter is the busiest and biggest season, and in this economy analytics are more important than ever. With holiday traffic starting in November and peaking in early-December, now is the time to make sure your site is in the best shape to maximize holiday traffic and revenue. To help you better analyze your campaign performance, optimize your web pages, and drive even more traffic to your e-commerce site during this crucial time, we'd like to share some tip and tools you can use in Analytics and other Google products. 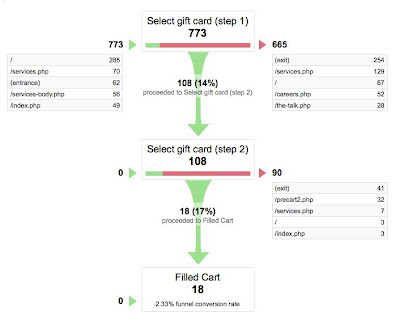 Learn how many shoppers drop out during each step of your shopping cart conversion process. Then, work on the steps that lose the most customers. Website Optimizer, our free testing tool, is a great way to improve those key pages. Find out where your most profitable customers are coming from, and direct your advertising dollars to target customers in those areas. Get data for region-specific keyword performance in your Analytics account. 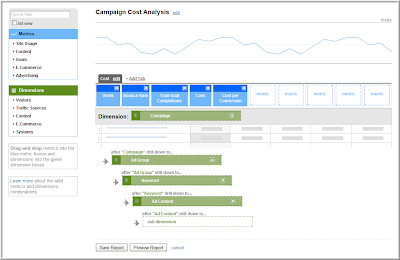 Create more targeted AdWords campaigns by region. Watch this video for a step-by-step demo. Google Product Search enables shoppers to search for and find products to buy online, and enables you to submit your products for free and target users shopping on Google. Google Product Search is currently available to merchants in the U.S., U.K., and Germany. If you've never used Google Product Search, you can start submitting your products using feeds you've already prepared for other shopping engines. Visit our Google page on holiday success to see a full list of tips. We hope these tips and tools help you make the most of your holiday season! For many of you the fourth quarter is the busiest and biggest season, and in this economy analytics are more important than ever. With holiday traffic starting in November and peaking in early-December, now is the time to make sure your site is in the best shape to maximize holiday traffic and revenue. for, Justin Cutroni's upcoming seminar at Emetrics DC this Monday, October 20 -- Google Conversion University . The seminar is a good idea for anyone who wants to get some hands-on exposure and training on efficient and practical data-driven marketing using free tools from Google, especially Google Analytics, but also Website Optimizer, Ad Planner, Insights for Search, and Webmaster Tools. The training will be geared towards the intermediate user, but both experts and beginners will profit from attending. And it will be led by one of the most knowledgeable, fun and engaging practitioners around - Justin Cutroni. Justin is a Google Analytics Authorized Consultant from Epikone, and also the author of Google Analytics Shortcut. Also, he's a staunch Boston Red Sox fan who is probably biting his nails as I post this (the Red Sox are a baseball team in the playoffs, but are having a tough time against the Tampa Bay Rays). We're pulling for you Justin. Whatever happens to his favorite team, you can expect a fun and enriching day full of real world marketing concepts and techniques, including an examination of tracking and optimizing a site like www.redsox.com, with a look at site branding and keyword campaigns and the tracking needed to improve both. The class will be small with a lot of hands-on training, and is relatively inexpensive at $295 for the day. Justin will be able to discuss and troubleshoot your own site and campaigns, as well as web analytics implementation and goals. To attend, simply register or modify your existing registration. This is a quick highlight on, and reminder to register for, Justin Cutroni's upcoming seminar at Emetrics DC this Monday, October 20 -- Google Conversion University . The seminar is a good idea for anyone who wants to get some hands-on exposure and training on efficient and practical data-driven marketing using free tools from Google, especially Google Analytics, but also Website Optimizer, Ad Planner, Insights for Search, and Webmaster Tools. The training will be geared towards the intermediate user, but both experts and beginners will profit from attending. And it will be led by one of the most knowledgeable, fun and engaging practitioners around - Justin Cutroni. We're attending Emetrics DC again this year, where we've made a lot of announcements in the past, including the launch of Website Optimizer two years ago. We love this conference because it's aimed at people interested in web analytics and testing, and it brings together the power users and thought leaders in the industry including many members of the Web Analytics Association. Come for a full day of training on intermediate and advanced implementation of Google Analytics delivered by Google Analytics Authorized Consultant Justin Cutroni from Epikone. Justin will cover all the basics, including the reporting interface, and will get in-depth on campaign tracking, goal, funnel and filter set up, and e-commerce tracking. He'll also discuss using Google Analytics data to take action and optimize your online marketing efforts and your website. Then he'll touch on other Google tools you should try using, such as Website Optimizer, Ad Planner, Insights for Search, and Webmaster Tools. To attend, simply register or modify your existing registration and pay only $295 for the entire day. Both Bryan and Tim are Website Optimizer Authorized Consultants. Bryan will be signing and giving away copies of his book after his 11am session on testing at the Google Analytics/Website Optimizer booth on Wednesday, October 22. Later in the day both Tim and Bryan will be signing and giving away their books after the 3pm panel on multivariate testing also at our booth, Then on Friday, October 24th, Tim Ash will be signing and giving away his book after his Landing Page Testing workshop. Hope to see you at Emetrics. It's not too late to register! How do I actually use Analytics to optimize AdWords? campaign. But how do you know which sites to pick? If you knew which sites were already sending you high value traffic, why not run your ads on these sites? This video will show you how to use Google Analytics to identify the best sites by using the Referring Sites report. There are a number of easy and effective ways to use Google Analytics with AdWords – whether you want to identify the best keywords, save money on bidding, expand your business or refine your campaigns – and we’ll post more of these videos soon! Google Analytics is full of insights that can benefit your AdWords account, and your business. To help you make the most of this information, we've started an introductory video series called “Google Analytics in 60 Seconds.” The first two videos explain two easy ways to refine your targeting. You can find them below and as part of the Google Analytics Conversion University playlist. Now, you no longer are flying blind when you target your campaign by location in AdWords. Use the Map Overlay report and location data within Analytics to see, geographically, where your visitors are coming from – or where they aren’t coming from. You can then use this information to refine your AdWords marketing with location-targeted campaigns to build your business. Note: You can also use the recently launched Geographic Performance report within AdWords to see similar information, but it currently does not have a visual component nor includes some of the metrics available in Analytics, such as time on site and bounce rate. The Google content network is the largest contextual advertising network in the world, comprised of high-quality websites, news pages, and blogs that partner with Google to display targeted AdWords ads. And within AdWords, you can hand-pick which sites you'd like your ads to run on by creating a placement-targeted campaign. But how do you know which sites to pick? If you knew which sites were already sending you high value traffic, why not run your ads on these sites? This video will show you how to use Google Analytics to identify the best sites by using the Referring Sites report. are brought to you by Google authorized Seminar Leaders. These guys eat, live & breath Google Analytics! Hundreds of satisfied people have attended so far. You can attend the Intro day or the Advanced day... or both! Course materials will be provided to all that attend and you even get a $50 AdWords credit for each session. Learn more about the topics covered and a full calendar of our sessions at the Analytics and AdWords Seminars for Success page. Take your pick from New York, Phoenix, Columbus, Los Angeles, Seattle, Las Vegas and San Jose! These are full day seminars chock full of information on "how it works" and "how to make it work" for your website. This course is ideal for marketers, web designers, web analysts and anyone who wants to improve their business online. Analytics Seminars for Success are brought to you by Google authorized Seminar Leaders. These guys eat, live & breath Google Analytics! Hundreds of satisfied people have attended so far. You can attend the Intro day or the Advanced day... or both! San Jose, CA - Feb 9, 10 - RegisterLearn more about the topics covered and a full calendar of our sessions at the Analytics and AdWords Seminars for Success page.
. You might want to check out Web Analytics Glory in Just 30 Minutes: Measure More Than Clicks which will be presented by our own Avinash Kaushik on Thursday at 11:45am. Afterwards, he'll be doing a book signing and giveaway of Web Analytics: An Hour A Day in the lunch area at 12:30pm for the first 500 people who show up! Google will also have a booth that you can stop by in the expo hall, and there will be a book signing there as well. Tim Ash with SiteTuners, a Website Optimizer Authorized Consultant, is the author of Landing Page Optimization: The Definitive Guide to Testing and Tuning for Conversions. He will be singing books at the booth from 4:15pm to 5pm on both Wednesday and Thursday. Tim will be speaking on Wednesday at 3:00pm in the panel Advanced PPC: What It Is, How to Avoid the Pitfalls. Then on Thursday, Tom Leung from the Google Website Optimizer team will be part of a panel on Landing Page Testing Best Practices. Tim's book signings will happen directly after these talks. This new show is also taking place this week on Thursday in San Francisco. It's a comprehensive one day show for entrepreneurs - and those thinking of becoming entrepreneurs - to connect with each other and be inspired by those who've already walked the start-up path. Our friends Dave McClure and Jeff Veen will be speaking, among others. Take a look at the day's sessions where you can learn about very facet of making an idea a reality, from product design, marketing and monetization to scalability and strategy. Then next week, SMX (Search Marketing Expo) East starts in New York City from October 6th to the 8th. Search marketing is of course right up Google's alley and Google Vice President of Search Sales and Sales Operations Tim Armstrong will be making a keynote during the show on Tuesday morning, after which, Avinash will be doing another book signing and giveaway at the Google booth. Then, at 3:15pm on Tuesday, Jon Diorio on the Website Optimizer product team will participate in a panel on "Landing Pages & Multivariate Testing", after which Bryan Eisenberg from FutureNow, another Website Optimizer Authorized Consultant, will be at the Google booth doing a free book signing of his book, Always Be Testing: The Complete Guide To Google Website Optimizer. At 4:45pm on Tuesday, Avinash will be speaking on a panel called "Paid Search Analytics." I will also be presenting on behalf of Google Analytics and Website Optimizer on Tuesday in a theater presentation. Members of our team will be at all the shows, and again, we hope we run into some of you! Over the next few days, we're attending three conferences, Online Market World and Startonomics, both this week in San Francisco, and SMX East, next week in New York City. We would highly recommend all three - more details about the shows are below and you can register at the websites. Maybe we'll see you there! We've always found that we learn more in one day at these conferences then we do in weeks of sitting in front of our computer screens. Nothing helps us stay up-to-date more than having conversations with other smart people and learning new skills in seminars. Also, some authors who are near and dear to our heart are doing book signings at two of the shows, where they will be giving away copies of their informative and cutting edge books. This conference starts Wednesday and runs through Thursday in San Francisco. If you're doing any marketing or selling on the web, this is going to be a smart show for you. Take a look at this agenda. You might want to check out Web Analytics Glory in Just 30 Minutes: Measure More Than Clicks which will be presented by our own Avinash Kaushik on Thursday at 11:45am. Afterwards, he'll be doing a book signing and giveaway of Web Analytics: An Hour A Day in the lunch area at 12:30pm for the first 500 people who show up!